Film Noir Buff: H. Herzfeld: This is not your Fathers store…well not totally. Charles Darwin’s theory of evolution revolves around survival of the fittest. Recently, another scientist hypothesized that Darwin’s theory is more akin to survival of the luckiest. What then would you have if had a creature that was both the fittest and the luckiest? Why H. Herzfeld in NYC of course. H. Herzfeld, located in midtown Manhattan1 has survived for over 70 years primarily because it is capable of adapting the term “classic” to the needs of the present. Although the store is geared for the more mature and self-assured man, there are many things suitable for the younger person looking for a quality upgrade. It is a nirvana for the sports coat and blazer set in terms of accessories. The overall look offered is Anglo-American which can mean a lot of different things these days. The Englishman prefers double breasted suits with woven ties and strongly patterned shirts, it is more military, alert comportment. The sports coat is not a strong look there, but the “businessman’s” look is quite stable. The American likes a softer, less built up more playful look. Sports jackets are common in town and fabrics the English would never wear to work because of their colonial associations, work here because we ARE the one time colonies. 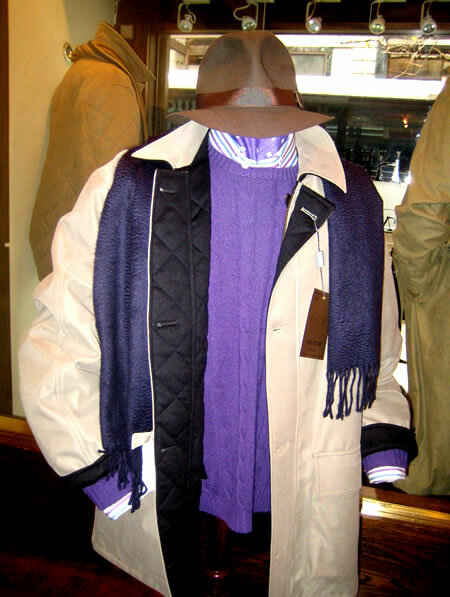 I would say H. Herzfeld is dimpled in the middle between the natural shouldered look and the small but elite tradition of the Jermyn Street shops in London, where stylish secrets lay in drawers waiting to be rediscovered by some savvy owner. At H. Herzfeld, One can always find a discontinued handmade piece good which will absolutely make an outfit. Today, to the outside world self image may go hand in hand with marketing but the inner dandy, as they say, is in the details. H. Herzfeld has three tailors on the premises who work both on their own and in tandem on customer projects. In any case, the tailoring department is not wedded to any particular look, although a moderate English look is the standard production. However, they can produce a variety of “looks” for the discerning client. There is a wide assortment of fabric choices. Odd dress trousers are a strong suit here in ready-to-wear, made-to-measure and custom make. H. Herzfeld is always trying to provide classic elegance which is updated for the contingencies of modern living. In terms of providing classic elegance a polo coat can either be styled, rather like a throwback, exactly the way it was in 1956 or simply be an updated version of what a polo coat should look like in 2006. That is, lighter, softer material, slightly different cut and details for the modern dresser who appreciates a soupcon but not a dousing of tradition. Sometimes that which is hip and luxurious fuses harmoniously with things old world as with the baseball jacket in a bamboo colored micro fiber. 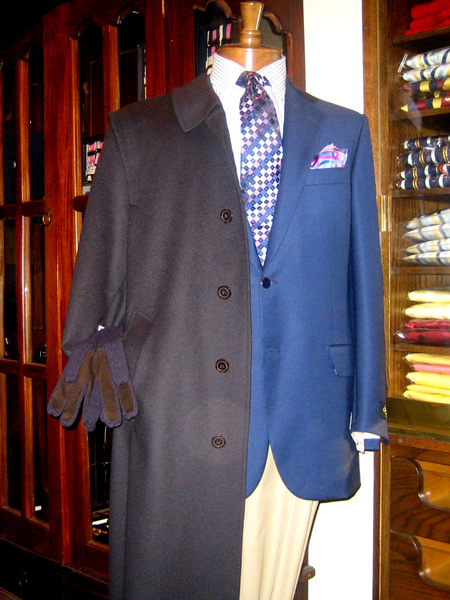 On the subject of micro fiber, the store also carries a “weekend” jacket in this material, lined in a cashmere blend. It is light weight, traditional and “cool”. 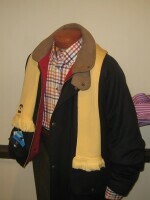 A camel hair, full collared cardigan in camel colored camel hair or in four ply charcoal cashmere. H. Herzfeld maintains a higher more consistent price point but they ensure that you are only paying for quality, not for a label. Cashmere sweaters and vests are from Scotland where the water from the river Tweed produces a finishing on the fabric which makes it incomparably soft and luxuriously lofty. H. Herzfeld is reminiscent of the traditional English shops along Jermyn Street, Bond Street or Piccadilly with some contemporary accents for the younger gent. Those stores have and continue to deliver to their clients frank, helpful suggestions with an almost military crispness and precision. This same deeply knowledgeable service is presented by H. Herzfeld to the American client right smack dab in the middle of midtown Manhattan. 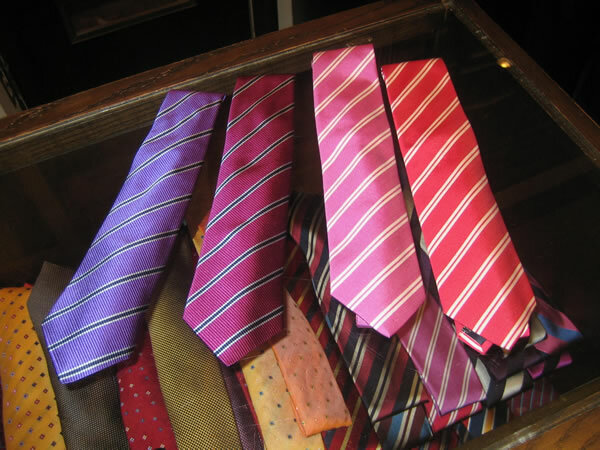 Seven fold ties are carried, and make a wonderful full knot for wear with cutaway collars. 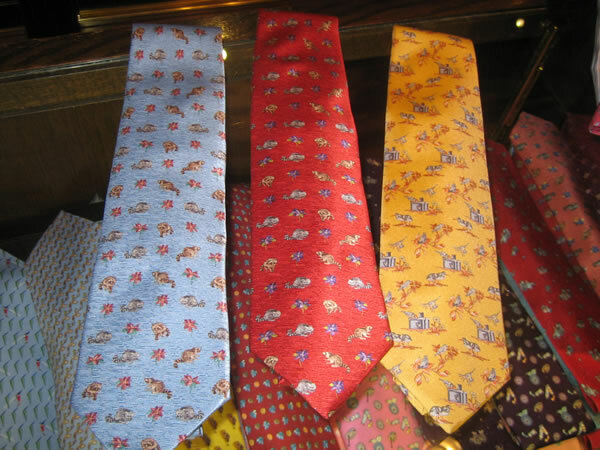 In fact, the store has a bewilderingly assorted selection of neckties. 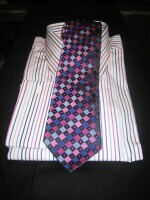 Prints and woven ties in both playful serendipitous patterns and serious solid citizen patterns. All ties are of the highest quality with linings of wool. 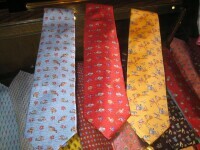 Many of the ties are made up especially for the store. 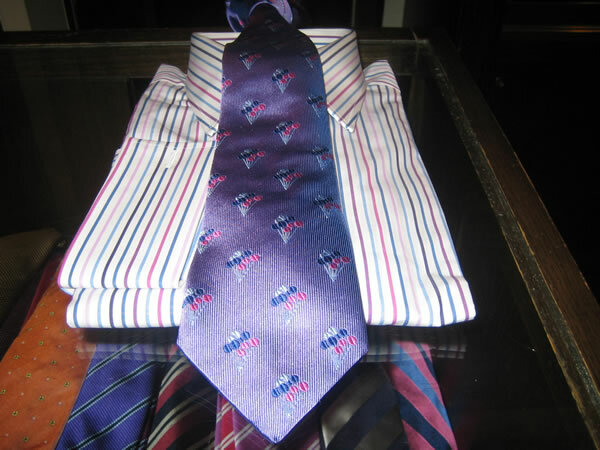 H. Herzfeld carries Vineyard Vines ties, Lee Allison ties, Holliday and Brown, Richel, Leonard of Paris, Drakes and a dozen other makes. The only thing consistent here about the ties is their quality. The new natty indulgence is the eleven fold (that’s right, a single piece of silk folded over eleven individual times as in “Mine goes to eleven”) by Dolcepunta, printed, woven and many with the trade mark round (and thus hand cut, rolled and finished ends). Atkinson’s poplin ties which are a mixture of wool and silk that create an elegant and matchless look went out of business and then, phoenix-like, re-opened. This is a good thing because the ties are so unique and it proves that survival of the fittest can be taken one step further to revival of the fittest. Soon chukkas from Hield in suede with a fancy rubber bottoms are on order for a casual man-about-town type of flair. Pantherella socks both sized and one size fits all. 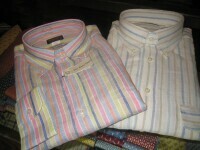 Shirts in many different, attractive patterns and colors are also a feature of this store. They have a large selection in sizes ready to go and three different shirt programs for made to measure and custom shirt services. 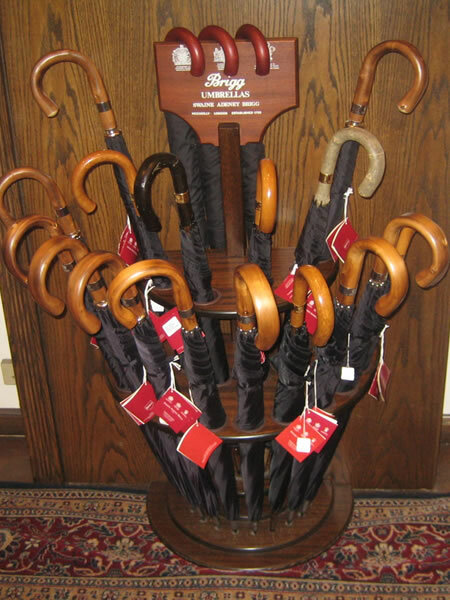 English, Italian and Swiss fabrics are offered in a large array. They carry boxer shorts in the store’s own label made from Japanese cotton and from makers such as Zimmerli. Gloves are carried in a wide array of hides and linings (and without linings). Straw Hats from Lock and felt hats from Borsalino. Casual shirts by Paul Shark are exquisite in both knit polo style and woven madras button downs, traditional and hip all at the same time. 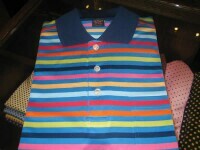 Magnificence of color, fabric and pattern matching combine to make these a superior golf shirt. Again, proving there can be a crossroads between old and new. Intimidation is a result of ignorance and most men are in the dark ages when it comes to deciding what choices to make and suspicious of salesman pandering to their egos in order to make a sale. That can make entering a seemingly exclusive shop a somewhat quietly desperate experience. However, the atmosphere at H. Herzfeld is relaxed and the prospective client here gets the same service whether he buys one tie, a whole wardrobe or nothing. 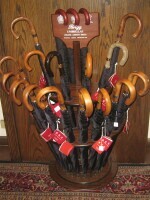 Old customers are treated like family because H. Herzfeld wants clients for life not a mere sale. And H. Herzfeld is chock-a-block with sartorial knowledge. The entire staff is expert in those matters of what makes a man look good. But it’s really all about one of their longtime salesmen, Ira. Ira knows everything. I mean everything. His taste in clothes and their appropriateness for the occasion intended is phenomenal. Even those genres of dressing style that are not to his taste he understands perfectly. This says to me, he has forgotten more about style and clothes than many of us will ever know. It would not be far off the mark to declare Ira a national “dandy” treasure. And Ira is the high priest presiding over the cult of the blazer and the tweed suit. 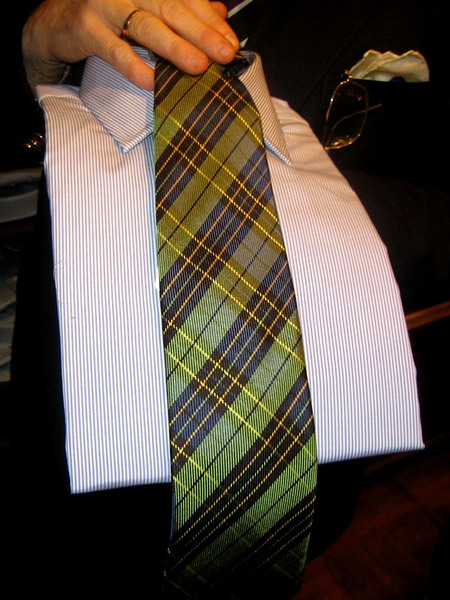 For instance, whilst showing me a green tinted, plaid tie for wear with a navy blazer he brought the shade of grey flannels in as an element to consider along with the tie, which was an eye opener for me. Ira is the details god in the store. He knows which things are good and he remembers items of style that have passed into lore. You can tell him your needs or describe an outfit you want to spruce up and he will come up with the answer for you. I would listen to Ira’s advice about dressing without question for anything involving traditional men’s clothing. His modesty and graciousness is astonishing considering it is worth his weight in spondulaks to have him set up a series of tie, jacket and shirt combinations and give one pointers on how to match things handsomely. Ira really needs to write a book to preserve his vast and irreplaceable knowledge of traditional men’s dressing. If I were a writer, I would record it all myself and publish this Library of Alexandria for the sake of stylish posterity. Ira knows everything and over a long span of time (including periods of stylish dress that died out long before his time) and in such enviably rich detail. 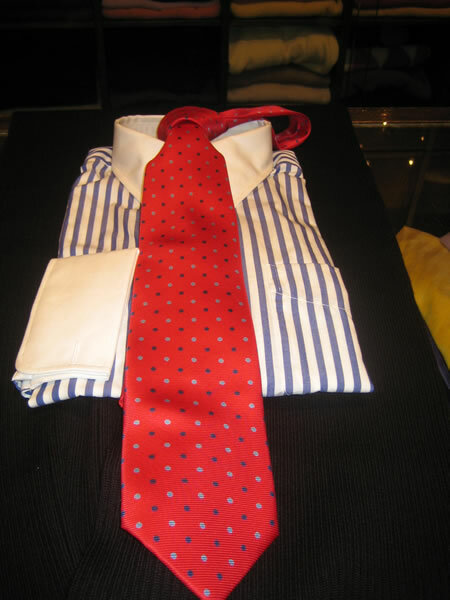 He has seen and worn every item of fine tailored clothing. And his taste is magnificent. If Ira tells you that an item will make you look good, buy it! The dinosaurs, the large mammals, the marsupials, the carrier pigeon and the genuine, old guard republican, they all have seemingly either gone the way of extinction or are close to it. The same is true for the haberdasher. However, there are still some holdouts who hang on because they are ingenious mutations, sartorial chameleons who can adapt to the times and remain “classic”. Although the barbarians are arguably at the gate of style, H. Herzfeld stands like a citadel of sartorial light. There may come a time when a store like H. Herzfeld is excavated like some long forgotten Inca temple yielding curious relics from the “tailored age” but for now, H.Herzfeld by sheer virtue of its innate excellence, avoids the slings and arrows of those who would extinguish style from the world. Navy loden coat Breton Blue Belvest blazer, cream, lightweight gabardine pants. Knit gloves with suede palm. Hunting coat with cartridge pockets in Navy Blue Flannel wool (cotton also available) it is Teflon treated for water repellency, suede collar and red wool lining. Perfect for treating that rare game you’ve landed to a cozy lunch on the weekend. 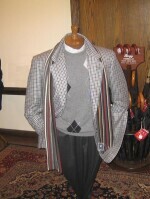 100% wool sports coat, cashmere argyle sweater, flannel trousers, cashmere scarf. Cream colored weekend jacket, micro fiber shell, lined in a wool/cashmere blend. 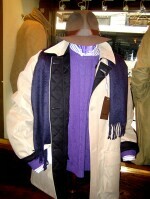 Purple cashmere cable sweater, Borsalino hat. Shot from lower back landing of H.Herzfeld. Striped for summer fun. High quality repp silk ties. Leonard of Paris neckties. Some people consider these an acquired taste and wear little else. 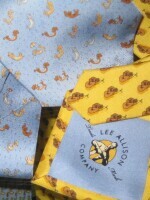 Lee Allison ties. Serendipitous fun ala 1950s-1960s. Blazer accoutrements. 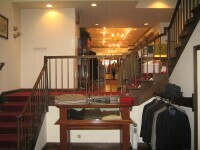 H.Herzfeld’s staff are experts at dressing the blazer and sports jacket. If you need something last minute to go with something tailored but casual, this is your first stop. Some Jermyn Street dash. H.Herzfeld has always considered itself positioned at a crossroads between the American natural shoulder and English Bond Sstreet ethos. 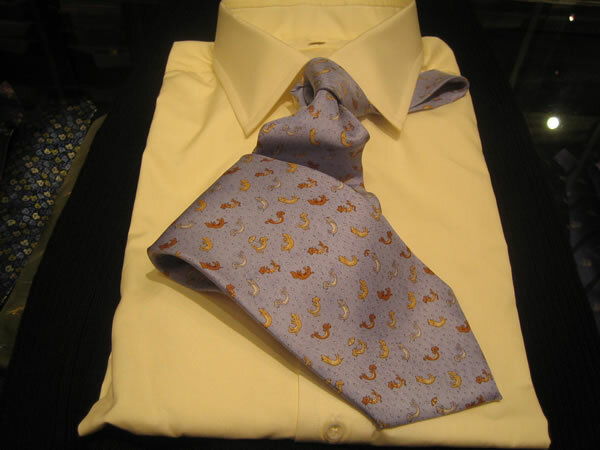 A rich cream shirt with a Lee Allison tie on it. It’s raining cats and dogs! At least show the girls you have SOME sense of humor. 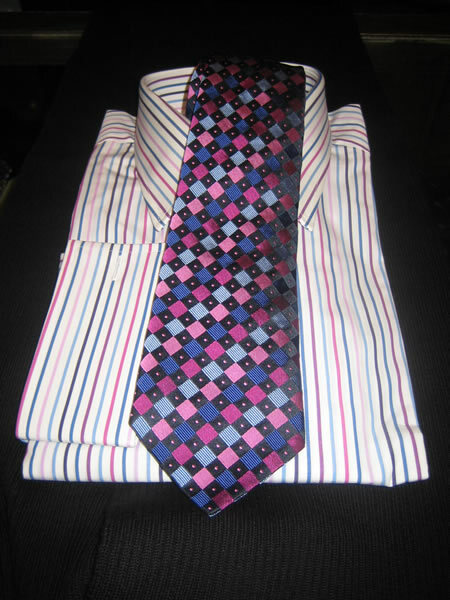 Matching all the colors in both shirt and tie well takes some practice. These guys have been doing it for a long time. Let them show you the way. 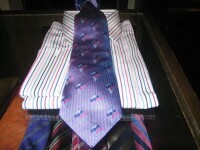 Again, the Bond Street/Wall Street style. Imagine Gordon Gekko and Francis Urquhart shaking hands in a photo op. Handmade cotton Paul Shark knit shirt for summer playfulness. These shirts are beautiful and comfortable. Paul Shark linen button downs in the “Prep school’s out, let’s summer” tradition.